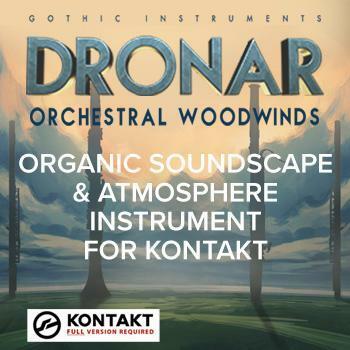 Driven by the award-winning DRONAR engine for Kontakt, Orchestral Woodwinds can create sophisticated, mind-expanding atmospheres caused by just a few keys (one to four is recommended). The DRONAR engine automatically distributes a chord in the middle range, adds a root bass note, a high note, and then adds developing sound effects. Eight simultaneously sounding sounds are animated with an LFO, a rhythm sequencer and arpeggiators to liven up them. The results are rich and dramatic.